Our very first cruise was 30 years ago for our 20th anniversary on the Norway out of Miami so this is another NCL ship for our 50th. We thought this would be the best way to see Hawaii. No packing and unpacking and no small planes to island hop. Booked all our excursions thru NCL before we left. Traveled with another couple so we printed out the details on the excursions in each port and discusses and decided which we wanted to do. Our favorite was the Deluxe Road to Hana, was a 9 passenger van so it was personal, was expensive but would recommend and do it again. It was a 7 plus hours tour. Wonderful driver stopped as offen as he could for pictures. Pearl Harbor isn&apos;t to be missed, makes you proud to be an American. This is our 5th cruise and was a little disappointed overall. Food and service was OK but not exceptional. Most of the food in the "free" venues was warm, never had anything really hot. Everyone in our party commented on this. Specially restaurants were good and service was very good. Didn&apos;t like the fact that there wasn&apos;t a beverage package, heard others commenting on this at the bars and around the pool deck. Overall we had a good time and glad we went this way but wouldn&apos;t do it again. Fire at the valcano national park, was told you don't usually see fire. Our very first cruise was 30 years ago for our 20th anniversary on the Norway out of Miami so this is another NCL ship for our 50th. We thought this would be the best way to see Hawaii. No packing and unpacking and no small planes to island hop. Booked all our excursions thru NCL before we left. Traveled with another couple so we printed out the details on the excursions in each port and discusses and decided which we wanted to do. Our favorite was the Deluxe Road to Hana, was a 9 passenger van so it was personal, was expensive but would recommend and do it again. It was a 7 plus hours tour. Wonderful driver stopped as offen as he could for pictures. 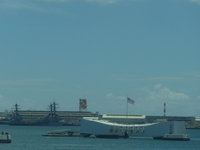 Pearl Harbor isn&apos;t to be missed, makes you proud to be an American. This is our 5th cruise and was a little disappointed overall. Food and service was OK but not exceptional. Most of the food in the "free" venues was warm, never had anything really hot. Everyone in our party commented on this. Specially restaurants were good and service was very good. Didn&apos;t like the fact that there wasn&apos;t a beverage package, heard others commenting on this at the bars and around the pool deck. Overall we had a good time and glad we went this way but wouldn&apos;t do it again. Our aft facing balcony was was very nice. Tight in areas but that isn&apos;t unusual on a cruise ship. Very Large spacious balcony was surprised at it, was almost as big as the cabin. Only negative was at night they clean the deck of the bar above us and all the dirt and debris washes down on our deck. It would be wet and dirty in the mornings.? Was never sweep or cleaned in the week we were there. Furniture needs to be washed/wiped down each day. Noise wasn&apos;t a problem if fact a couple of late afternoons they had live music so we sat on our balcony and listened. 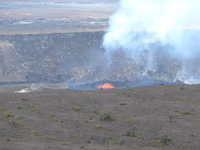 Were very lucky to see fire at the volcano, not only one eruption but before we left a second one was forming. 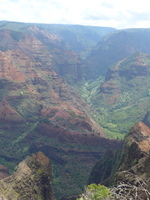 Enjoyed beautiful canyon all the flowers and vegetation on all the island are beautiful. Was a small group that morning, guys didn&apos;t want to go so just the ladies went. Saw spinner dolphins and beautiful fish. So glad we went. 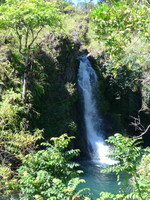 Did Delux road to Hana, loved it. Was expensive but would do it again. Was 7 hours but went by fast.